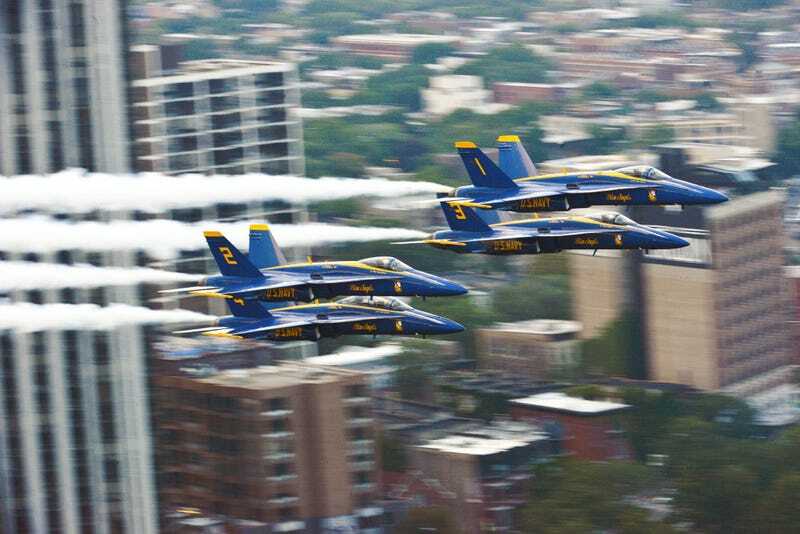 There are a few places where the Blue Angels regularly perform that put their aircraft in fairly close proximity to large structures, but Chicago may be the closest of them all. The shot above, released on the Blue’s Facebook page gives a thrilling perspective of the formation over the Windy City, but the Instagram video below shows a whole other story! The candid video shows the Blue Angels four ship formation blasting through a canyon of high-rises at nearly eye level on their way to the nearby coastline, a rare move for the team which usually avoids close proximity to tall structures during their shows. This sort of thing is not entirely unheard of though. The F-111 community in Australia was famous for their “dump and burn” maneuvers and high-speed, low-level, urban flyovers, some of which flew far below high-rise towers top floors. The Ten Best F-111 "Pig" Dump And Burn Moments Of All Time! For spectators on Chicago’s shore, It must have been awesome to watch the four ship formation literally pop out of the famous skyline and scream over the beach at high-speed. Little tricks like this are just one more reason why the Blue Angels remain one of the most famous flying acts in the world. Photos via Blue Angels Facebook page.